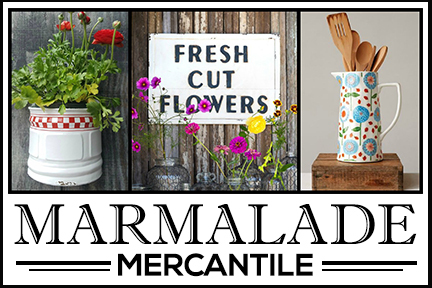 It’s the end of January and I figure we can also use a dose of cheery spring goodness to soothe our souls! 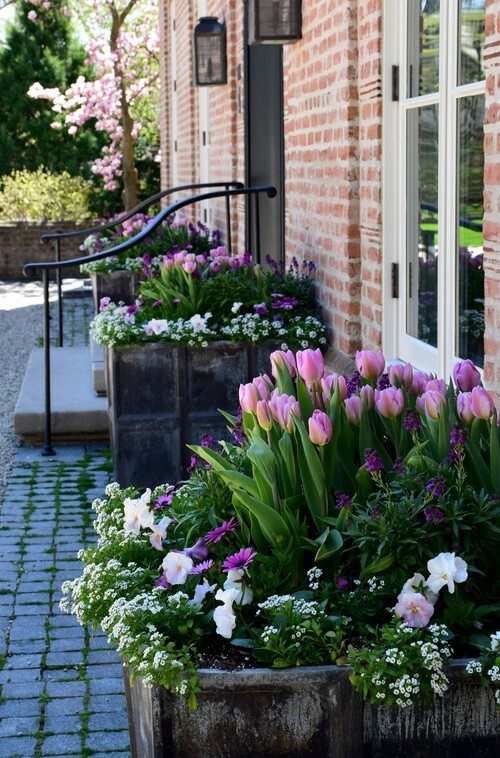 Enjoy this collection of spring bulb gardens to lighten your mood and help you anticipate the joy of longer days and warmer breezes, not to mention the beautiful colors of spring! 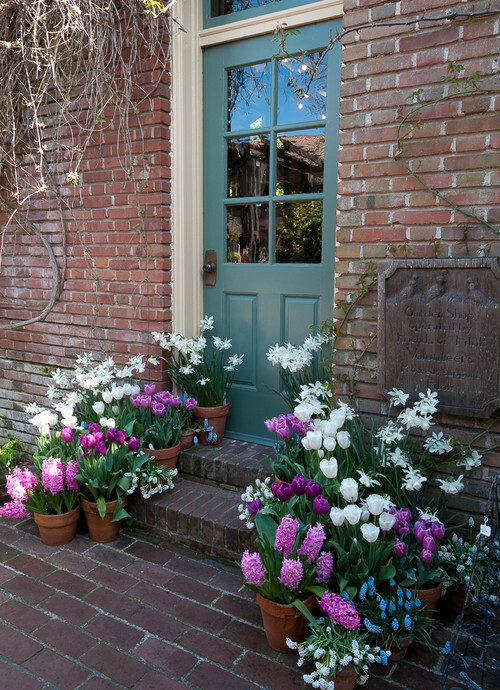 Every spring I kick myself for not adding more bulbs near the entryway of our home. 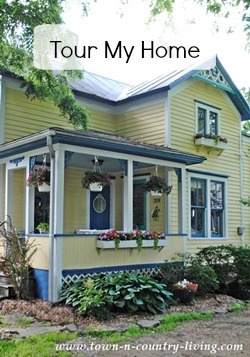 What a beautiful way to greet guests to your home. Not to mention how much you’d enjoy it yourself! If you’re like me and failed to plant bulbs near the front door, you can always add them in pots. Just don’t forget to plant some bulbs in the ground when fall rolls around. 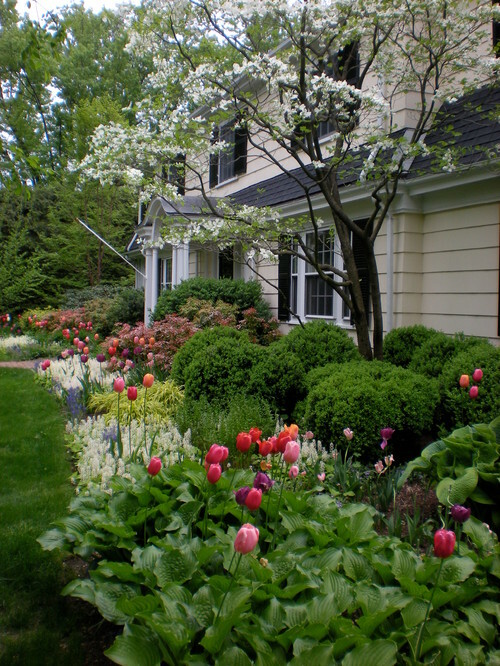 Planting bulbs in the midst of hostas is such a clever idea! One thing that I don’t like about bulbs is the way they look when they start to fade. You’re not supposed to cut the greens down to the ground until the leaves have died. 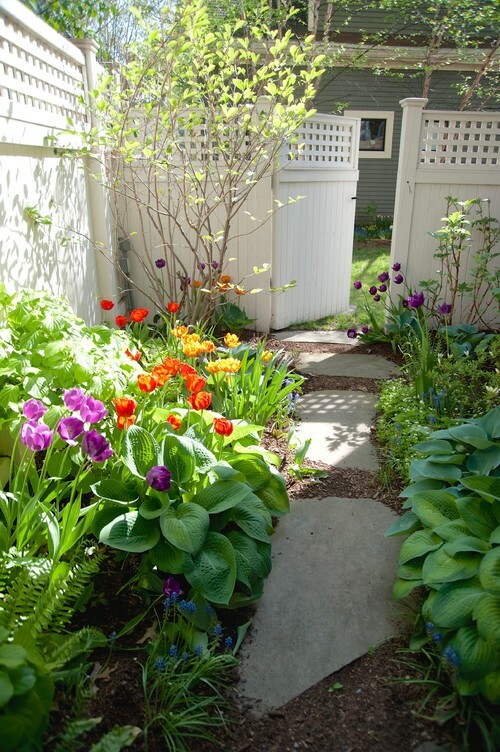 Hostas provide an easy way to hide the fading tulip and daffodil foliage. Photo by The Garden Concierge, Inc. 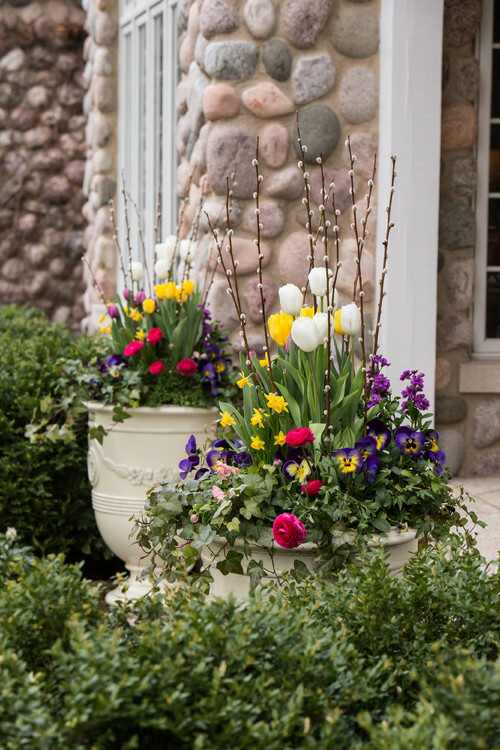 Pinks, yellow, and violet all come together to create a striking spring container garden. Flowering spring branches and trailing ivy complete the look. I must have one of these at my front steps come springtime! Not a fan of pastels? 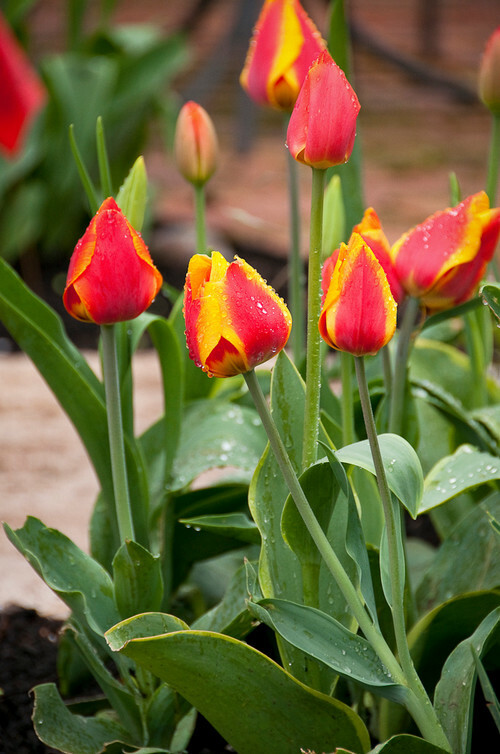 Choose more vivid colors for your spring bulb gardens. So gorgeous! 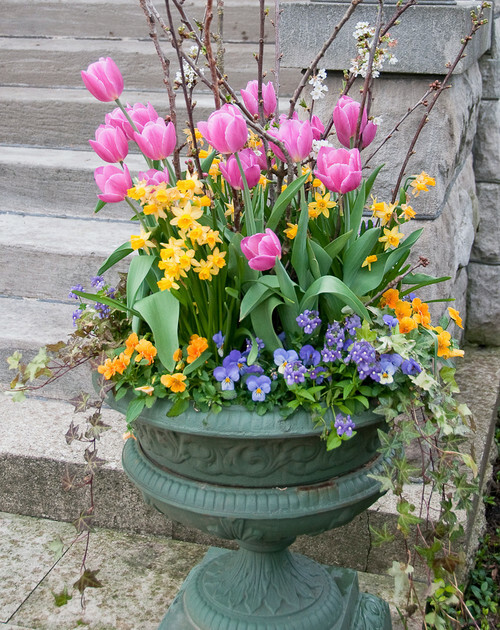 For a simpler look, stick with one type of spring bulb in a container. You won’t have to fuss with grouping different types of flowers and the look is still amazing. 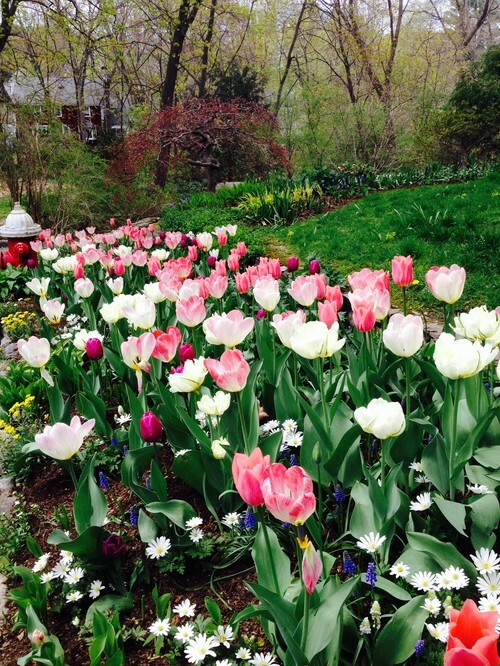 Have you ever noticed a wave of tulips bedded together like this? I always think it makes such a statement in the landscape and need to remember to plant an arrangement like this in the fall. 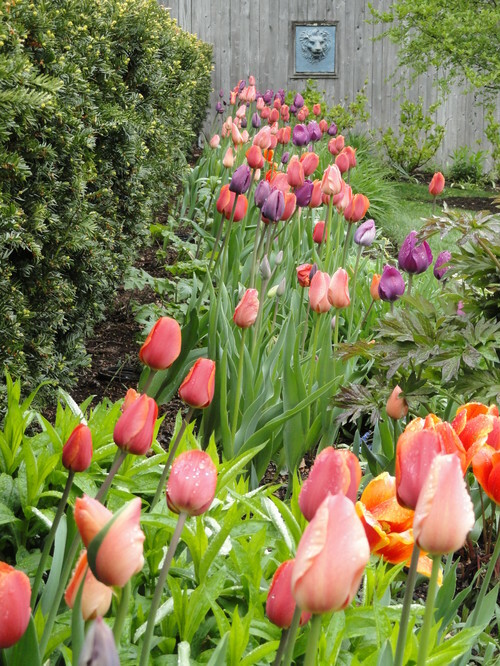 Tuck spring bulbs into any area of your garden. They look pretty in a courtyard with their cheery color. 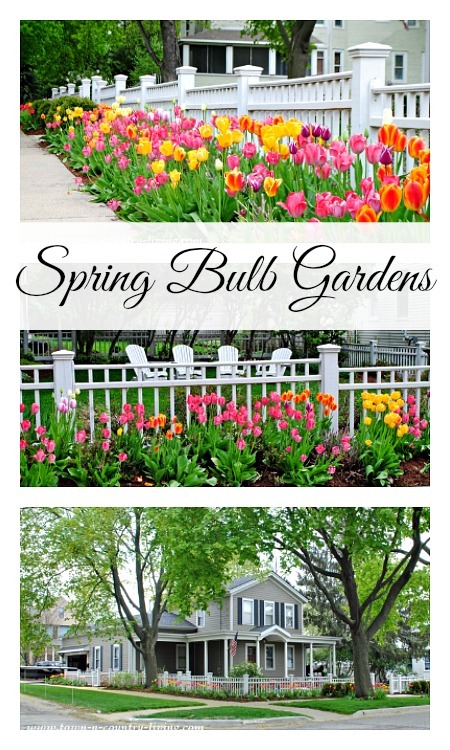 Another option is to choose one color of spring bulbs to populate your garden beds. 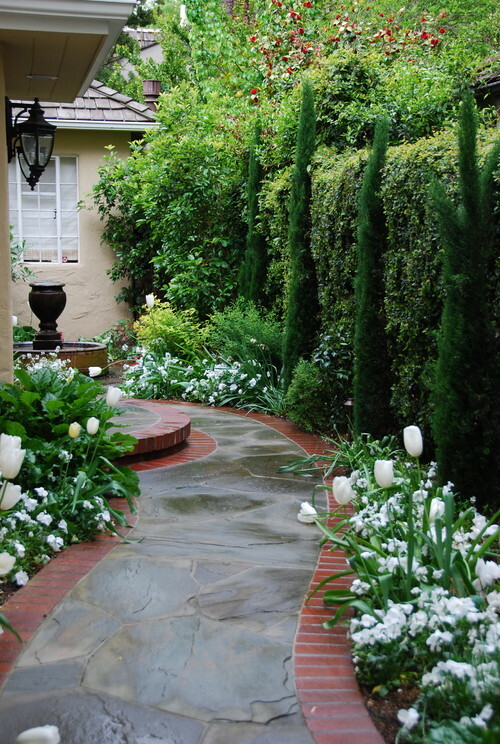 White and green gardens are elegant and serene. Note the use of various architecture of plantings to give this monochromatic garden visual interest. 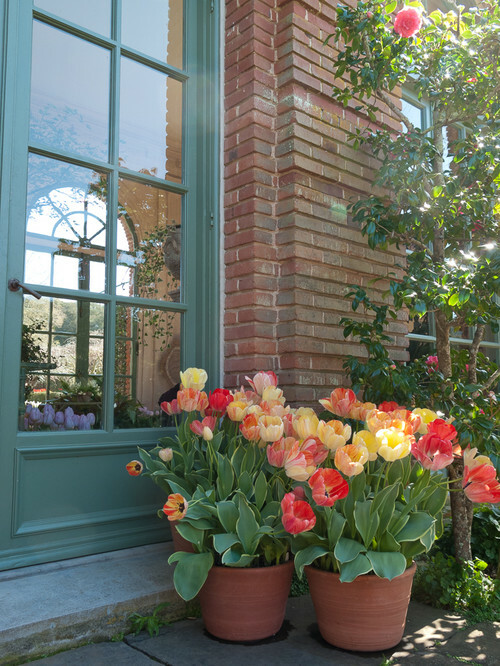 Make a colorful impact in your spring bulb gardens with vivid tulips. Just a few grouped together provides all the color you need. When I plant spring bulbs, I keep in mind the color of my house. As a general rule, I don’t like to plant yellow flowers in the garden beds next to my home since my house is yellow. Although, I do have yellow daffodils that were planted when the house was pink. Here’s one of my favorite spring bulb gardens in a neighborhood not too far from where I live. Every year we walk past this house and others like it in the spring. 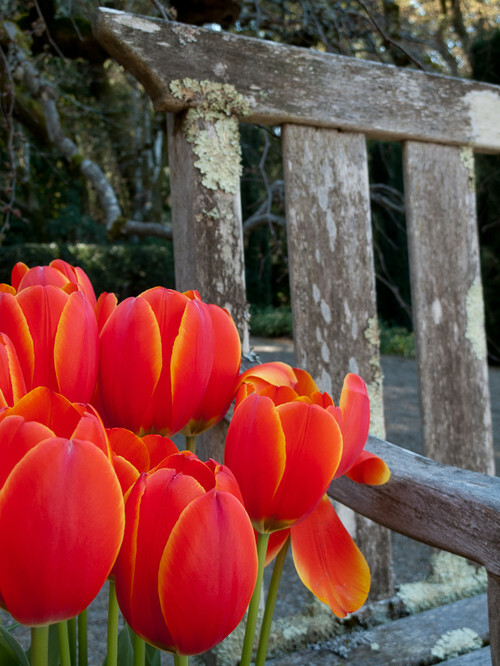 What type of spring bulbs do you have planted in your garden beds? Good morning Jennifer. Hope all is well. Love your post this morning and I can’t wait for spring. I have planted tulips very carefully and they never came up, only to find them elsewhere in the yard. Those silly squirrels just cannot leave them be! Oh well, at least they weren’t eaten. Have a great day. HOLD UP! We can be enjoying bulbs NOW inside. Put some stones in the bottom of a container, place your bulbs, and water just until the water barely touches the bulb bottom. Place in a bright window or room. NO direct sunlight. Come on gals with your sun porches, kitchen window sills WHAT COULD BE MORE LOVELY? Everyday is like spring. Paper whites are the fastest to bloom, but try tulips, crocus, etc. ENJOY! Hint #2 Using suction stickers hang some glass prisms in the windows. Shadows are lovely to enjoy during these cold months inside. Even toddlers enjoy the shadows on the walls. Remember the kids movie, POLLYANNA? This was part of that story! I love your ideas! I’ve never thought to try crocus indoors, but why not? They’d look adorable on the kitchen windowsill. I’ve never seen the movie Pollyanna, but I do remember a neighbor had a prism in her window and as a kid I loved seeing the colors of the rainbow from it. Great suggestions for adding a little magic to winter! I never have much luck with bulbs. And I love the look of tulips poking out of hostas, but any tulips I may have, are dead and gone way before my hostas are full and pretty. 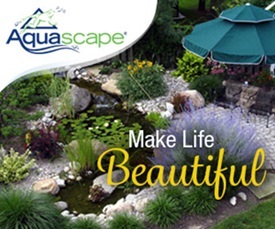 The midwest isn’t the best zone for some of the prettiest gardens. A little farther South makes all the difference. We can only do our best with what we have, I guess. I wonder if later-blooming bulbs would bloom late enough to be enjoyed with your hostas? I tend to buy the earlier blooming bulbs mainly because I’m anxious to see them. I have to admit that I am not a bulb-planter-person but I sure do admire those who are! And I sure do enjoy their labors of love. Love tulips so your pictures are so great. I live in a condo so I just have them in planters from mid May to August. My mother had tulips all along the yard in the house we grew up in. So beautiful. 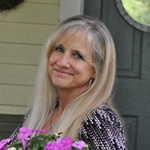 Tulips are very special to me as they are the flower that brought the man who would be my husband and I to begin dating. I love these beautiful flowers, i need to plant some of these too. I need to do a lot of things and hopefully someday i will get it all done. Since i retired i think the days have gotten shorter and shorter every year,lol!!! A while back I read an article that stated the Japanese have scientifically proven that the presence of trees, flowers, and their scents build our immune system. Forest air is soothing and landscapes offer a therapeutic healing. I too will plant more flowers and sit and observe their beauty and inhale their soothing healing fragrance.